Velodyne Impact-10 review | What Hi-Fi? 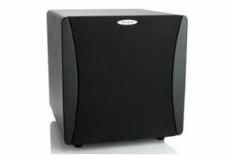 This is the big boy of subwoofers, positively dwarfing its nearest rivals and leaving some of them cowering in the corner. This is normally a good thing where generating low frequencies is concerned, though you'll need to make sure you can give your subwoofer enough room to breathe. With a downward-firing port, the Velodyne claims 150 Watts of continuous power, and there are line level and LFE inputs on that gloss black cabinet. As you may have guessed from the name, the Impact-10 has a 10in driver – there is also a 12in sub and a smaller, ‘mini' subwoofer, in this Velodyne range, too. Sure enough, the Velodyne delivers deep, air-moving bass notes, with the endless explosions of Behind Enemy Lines sounding punchy and powerful. As the Impact name suggests, this Velodyne is quite capable of waking you up should you doze-off during the late film, but there's subtlety and detail on display, too. All that's missing is a little more control to tighten-up the power available when the action really gets going – particularly fearsome and frantic scenes do see the Velodyne losing its cool a little. If your main concern is getting your trousers flapping then this Velodyne should be on your shortlist. But there are others available that offer a little more control.